Last night, about 7 pm we were sitting on the front porch when we were visited by this bobcat. We watched it walk across our driveway, then across our yard and into a neighbor's yard. It never paused -- just kept walking like it knew where it was going. Unfortunately, the picture is not very clear. But, you can see some of the cat's streaky black markings. You can also make out the bobbed tail. Seeing the bobcat is big news around our house. I had previously seen one at Eaton Canyon near the nature center. And, many years ago, our daughter told us she saw a bobcat in our yard. Actually, she said she saw a kitty with no tail. But, that's about it for our bobcat sightings. 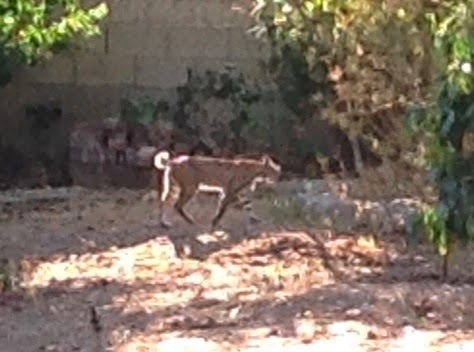 It is rare, but bobcats have been seen in some Pasadena neighborhoods. Bobcats are indigenous to the San Gabriel mountains and foothill areas. They are active in early morning hours and evening hours and each night may move two to seven miles within its territory. They hunt a variety of animals ranging from mice to deer, but articles seem to mention rabbits as a favored food. Coincidentally, I have noticed an abundance of rabbits in our neighborhood this year. The past few days I've been watching a pair of woodpeckers chipping away at the neighbor's tree. Not sure what kind of woodpeckers they are. Possibly Nuttal's Woodpecker, which is listed as common to Eaton Canyon. This is the male. And here is the male popping his head out of the cavity they've made. This was kind of chance shot. I couldn't see either of the birds, but stood under the tree listening to the woodpecker chip away. After a while, the male came out and quickly flew away. Nuttal's make cavities for nesting that are 1.5 in. by 7-10 inches. We will keep an eye on this nest. These woodpeckers lay 3-6 eggs which hatch after 14 days.